excerpt from The Everyday Internet; Maurice Blanchot’s The Everyday. 2016. Duplex: What draws you to making language and digital technology more physical? For instance, in May 2015 you wrote the entire iTunes Agreement by hand, and later that year began responding to all of your emails with handwritten notes. How do you envision the viewer responding to the tangibility of these typically digitized things? HN: Something I often think about in my work is how a familiar system, like language or digital technology, can be shifted to become something unfamiliar or unexpected. Both language and the digital are things we primarily think about interacting with mentally. Yes, your body may be holding a book so you can read, or your finger may be scrolling through Instagram, but primarily your mind is focused on digesting the information. It’s a mental engagement. By engaging with language or technology in a personal, physical, or relational way, I’m attempting to slow down the engagement and therefore draw attention to it. Language manifested physically on a large scale suddenly becomes a physical engagement that a viewer might have to walk around or move their body to read. In bringing technology and language into a physical realm and scale I’m also investigating boredom and patience. Having a body means dealing with inherent limits. Language and technology are often things we think about as limitless—what does it mean to place boundaries on those things through my body? Always + Forever; ink, balloons. 2016. 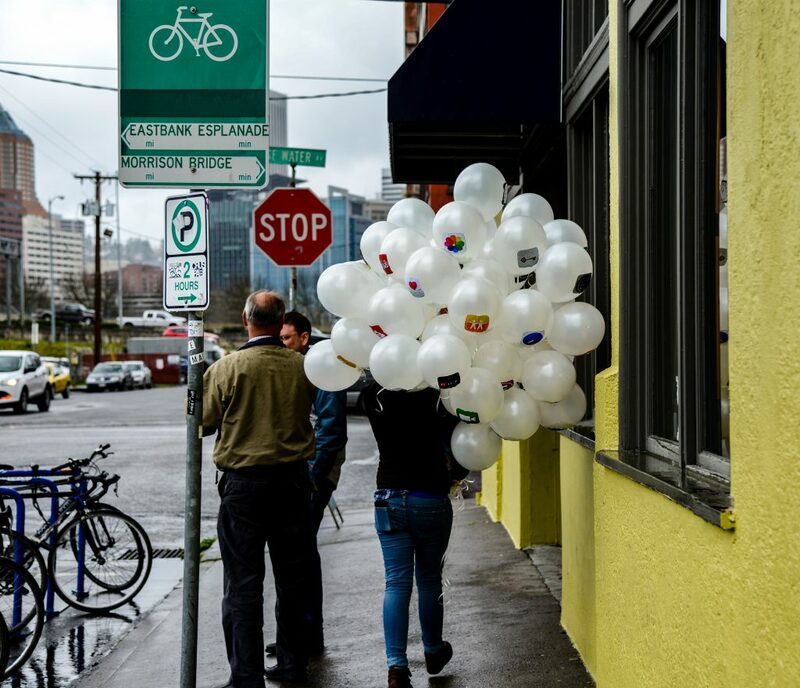 Duplex: There is a hopeful feeling in some of your work, especially in your use of balloons in #livingwiththecloud, Always + Forever and Wonderlust. How do balloons push your overarching concepts? What do they evoke for you? HN: As I move through ideas, my materials are chosen for the symbolic structure they can lend to my work. 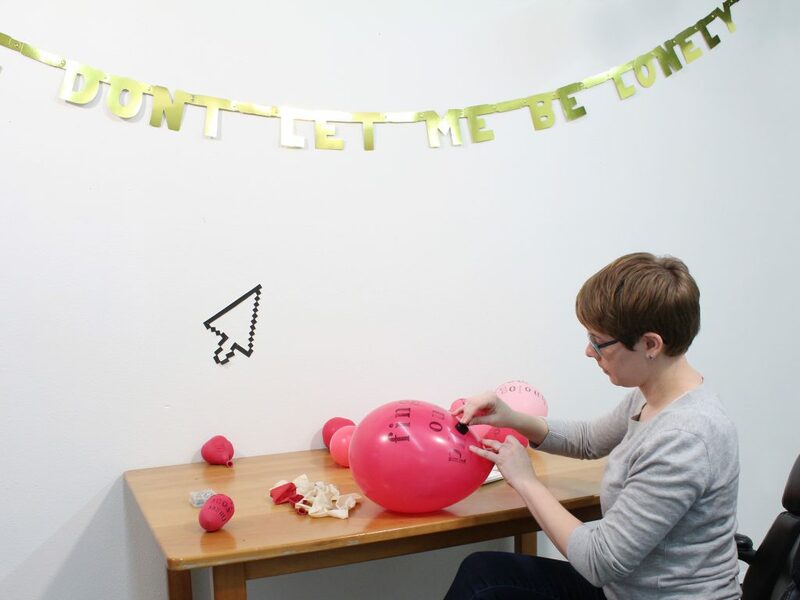 A lot of my recent work has utilized balloons as reference to celebrations. A common item for decorating for birthdays, anniversaries, or weddings, balloons denote momentous occasions in our lives. Balloons are a time-based medium, perhaps the most appropriate object for celebrations, not only marking when excitement is at its peak, but also visibly allowing us to watch a celebration come to an end and deflate as hours, days, and weeks pass—an apt visible display of human attention spans. 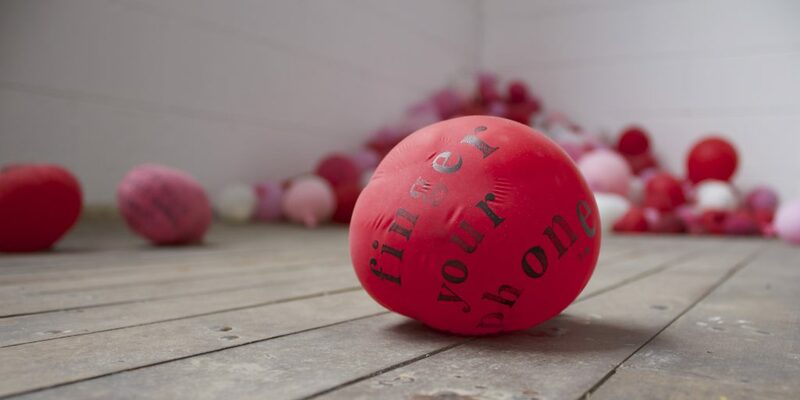 In my work, balloons become a metaphor for our relationships with digital technology—first bright, shiny, and exciting, yet soon acquiring the characteristics of everyday life, as dirt and time dull their sleek perfection. In the last couple months I’ve been thinking a lot about how we fill balloons with our breath, yet they seem so empty. I’ve been sewing balloon-size bags, out of stiff, but transparent, fabric to evoke the sadness of old, forgotten balloons. #LivingWithTheCloud; balloons, paper, markers, Instagram, iPhone. 2016. Duplex: Most recently you’ve been making work in .gif format. In one .gif, Brutality, the phrase “at a brutal pace” repeats over and over. Is this in reference to the repetitive and immediate nature of the .gif and of technology in general? HN: I heard the phrase “at a brutal pace” a few months ago while flipping through radio stations. In context, the phrase was used in a conversation discussing the overwhelming amount of police brutality against black men in the U.S. I couldn’t get the phrase out of my head. It seems like the perfect language to describe this moment in relation to technology as well as the ongoing disposability of bodies, and more importantly lives, of black men. Advertising has always worked to make bodies disposable, and the internet only heightens the body’s disposability. In some ways the internet is the purest form of democracy. Every voice and story is heard, so no voice or story can be focused on, which allows the unaffected (in this case, white people) to become numb to the stories allowing violence to continue and perpetuating the cycle. Our relationship to technology matters because it affects and reflects our relationship to the people around us. The .gif Brutality attempts to both reflect and harness the numbness. #allthethings; handsewn fabric, digital .gif. 2016. Duplex: You are currently a resident artist at Rainmaker in downtown Portland. How has taking part in that program influenced how you work? Do you have any patterns or practices that help enhance your productivity while there? HN: I’ve been incredibly fortunate to share the residency with five amazing artists, who have been really supportive, not just in my practice, but as we all struggle to find new work/life/art balances. My fellow residents have an amazing energy for pushing out work. I don’t work very fast, so for me it’s motivating to see how fast they bring ideas to life. Working in an energetic environment pushes me to move concepts out of my head and into a tangible format more quickly than I would left to myself. My favorite stage of making is the idea part—working things out—so the accountability of having other people checking in to my studio to see what’s new keeps me moving. I often start my studio time by simply making a list of phrases or words that are on my mind. I choose one or two phrases from the list that seem most salient to the day and stencil the words on a piece of poster paper and hang it on the wall for a couple days. This practice helps me tangibly live with my thoughts to see what ideas have generative power and resonance. Duplex: What local galleries or artists you look to for inspiration or guidance? Have you seen any particularly memorable shows lately? HN: I loved Lutz Bacher’s show The Secret Garden at Yale Union. I spent a long time taking that show in. Each piece consisted of one single, often subtle, gesture that in some way changed your awareness of the space or context around you. One thing that’s been on my mind lately is the idea of confidence in your work—knowing and trusting your instinctual gestures. For me The Secret Garden completely encapsulated what it looks like when an artist is confident in themselves and their work. Even though each piece was so simple, there was an incredible confidence and strength behind each move. 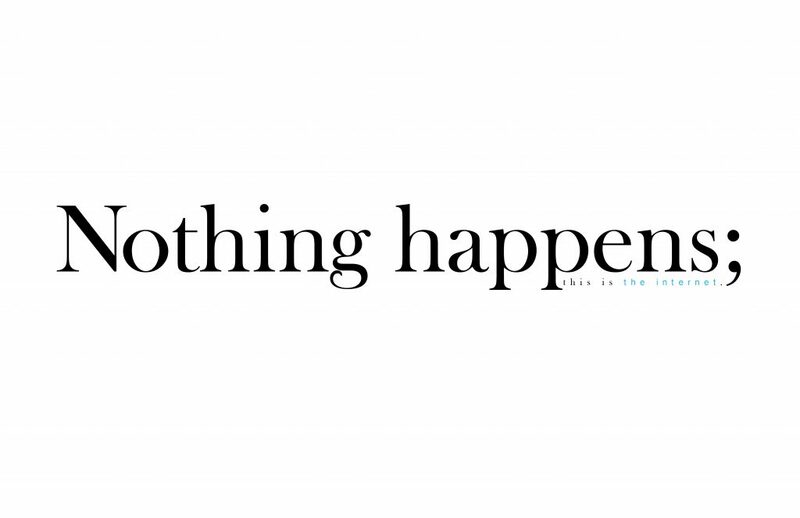 On another note, I’m really excited to see what comes of both Hap and Upfor’s new digital platforms. I’ll be following those with a close eye. Duplex: Reading and research play an active role in your artistic practice. What books are helping guide you lately? Do you also conduct research through other mediums, like film or podcasts? HN: My reading ranges widely from classic MFA school texts like Species of Spaces by Georges Perec or Invisible Cities by Italo Calvino to pop-psychology books about technology, to children’s picture books. I love pulling a phrase out of context to see the weight it gathers on its own. Sometimes it’s not even reading, but rather a phrase from a conversation, someone’s Facebook status, an advertisement, or even recently a drawing I made was inspired by a comment from a yoga instructor I follow on YouTube. Language shapes our lives and thinking all the time, so research comes from everywhere whether I seek it out or not. Right now I’m working extensively with Thoreau’s Walden. Walden is a classic American text driven into our collective conscious about how we should, could, want to, interact with nature. I’m cutting, pasting, and altering selections of the text to make a piece called Cloud Monologue, in which the digital cloud is personified, recounting its own perspective on how humans and the digital might interact. I have trouble retaining information through formats like podcasts and film, so those aren’t mediums I typically seek out for research unless something is specifically recommended to me. I often wish podcasts had transcripts! That being said, sometimes it’s a relief to cut some information out of my life, simply because I don’t enjoy the format. Being informed feels exhausting sometimes. Duplex: What’s next for you?